Recently, ArtSake was invited to write a guest post for the Mass Humanties blog, The Public Humanist. In it, we talk about how ArtSake is a place for dialogue about art, but that even more to the point, art itself is a kind of dialogue, a give and take between different forces, different ideas. Nothing embodies that notion better than a recent work by Niho Kozuru (Sculpture/Installation Fellow ’09). 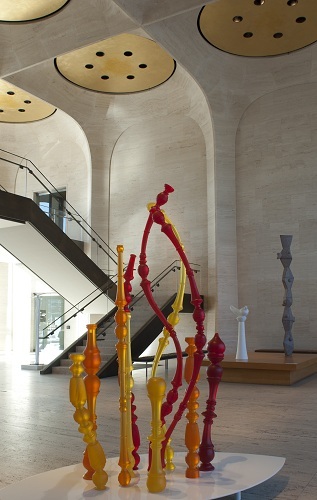 Niho was commissioned to create a sculpture for the permanent collection of the Sheldon Museum of Art in Lincoln, Nebraska in response to “Song of the Bird (Bird Song),” a granite and marble sculpture by Isamu Noguchi that has stood in the museum’s Great Hall for many years. Niho’s new work, “Transplanted,” is now complete and has been installed. Brightly colored and playful, it awakens the solemn, white-marbled space, catching the light to dance in the eyes. Made of rubber over steel rods, it is new material surrounded by pieces in traditional stone and metal. Constructed from molds cast from turned wood architectural elements, like urns, it is post-modernism smack in the middle of a temple of high modernism. Learn about more continuing adventures by past MCC awardees in our Fellows Notes. Image: Niho Kozuru, TRANSPLANTED (2011), in the Sheldon Museum of Art’s Great Hall (Photo by Francis Gardler, Lincoln Journal Star).